Every year on the closing day of the Calaveras County Fair & Jumping Frog Jubilee, fair-goers are treated to the only event at Frogtown that is perhaps more popular than the jumping frog competitions – the Destruction Derby. 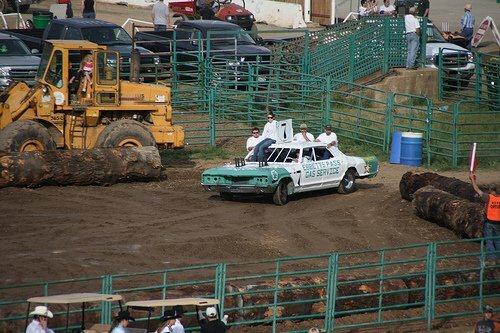 Fair officials estimate that a crowd of about 10,000 attend the demolition derby each year. Demolition derbies got their start in the United States, before spreading to other western nations. 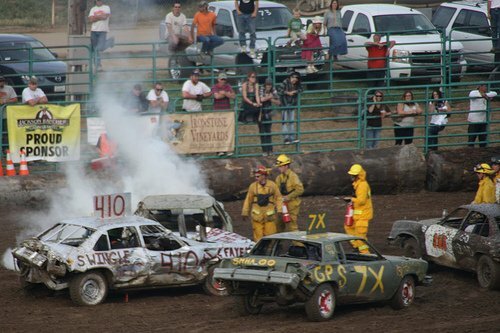 While rules vary from derby to derby, the basic destruction derby consists of five or more drivers deliberately crashing their vehicles into one another until only one drivable car remains. The majority of demolition derby rules surround the vehicle itself, and not so much the maneuvering of it. … all glass is removed from the vehicle, and deliberately ramming the driver’s-side door area is forbidden. The driver’s door is often required to be painted white with black numbers or blaze orange, or with contrasting colors, for visibility. Most demolition derbies are held on dirt tracks, or in open fields, that are usually soaked with water. This causes the competition area to become muddy, which in turn helps to further slow the vehicles. Some drivers use both the front and rear of the vehicle to ram the other competitors. Others tend to use only the rear end of the vehicle, to help protect the engine compartment from damage. …Drivers are usually required to crash into another vehicle every 2 minutes or they are labeled as “sandbagging” and become disqualified. The last running car wins the event; in order to speed up the end of a particular event, some derbies will require the last two cars running to make all hits from that point forward head-to-head, making contact only with the front ends. An event typically takes about 20 minutes. 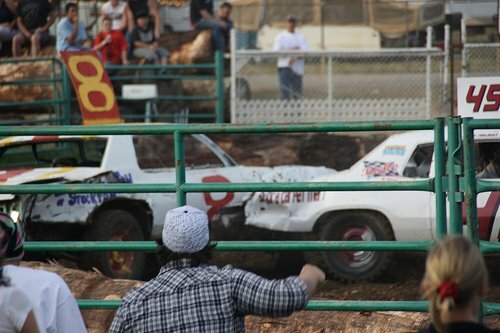 Check out these awesome action shots taken by Robert San Agustin during the 2011 Calaveras County Fair Destruction Derby. You can find more of his Calaveras County Fair & Jumping Frog Jubilee pictures on his Flickr page HERE. Derbies were first held by independent promoters in the 1950s. In 2001, the Los Angeles Times estimated that between 60,000 and 75,000 drivers participated in at least one of the 2,000 demolition derbies held in the U.S. that year. 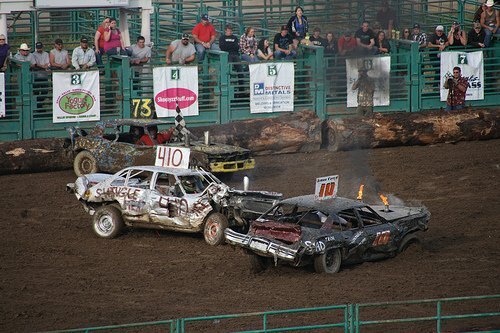 If you live in the immediate area of Angels Camp and are interested in participating in next year’s Destruction Derby, check out the official Calaveras County Fair Destruction Derby Rules. Here’s a little bit of video from the 2011 Calaveras County Fair Destruction Derby to get you pumped for next year….. This entry was posted on Monday, June 6th, 2011 at 3:02 PM	and is filed under Nearby Attractions. Both comments and pings are currently closed.